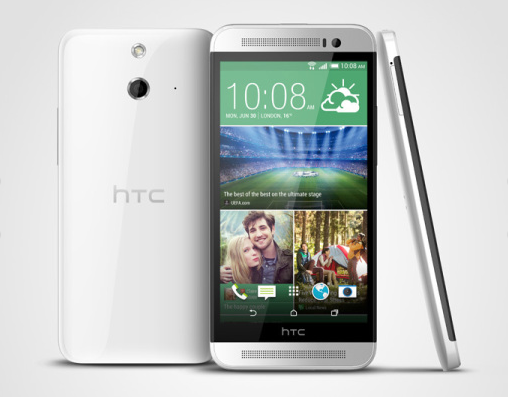 HTC has finally released a lower priced version of the HTC One M8 smartphone that is cheap and affordable which is the HTC One E8 smartphone. Though the HTC One E8 still hold on to the premium spec of the M8 smartphone, but the metal sheen is being replaced with a polycarbonate. The HTC One E8 device is a very stunning android smartphone and a very impressive gadget that operates on Android 4.4 Kitkat and powered by Quad core, 2.3GHz Krait 400. 5.0 inches, 1080 x 1920 pixels, 441 pixels per inch (PPI) and effective display features with LCD Capacitive touchscreen of 16,000,000 colors. and Secondary camera is 5 MP, 1080p@30fps. It's internal memory is powered by 16GB storage ROM and 2GB RAM. This smart device also has a microSD space of upto 128GB. , DNLA, bluetooth connection of verison 4.0 EDR, Standard MicroUSB port with USB version 2.0, USB Host with GPS of A-GPS. 4G LTE: 800, 1800, 2600 and LTE with CDMA version.